We are able to work with and incorporate some wonderful and unusual materials into our designs that make our fireplaces more than simply fireplaces but desirable, sculptured designer features. This suspended fireplace has decorative outer cladding made from zinc which provides an unusual depth, and look to the finish. Beautifully engineered and designed, the canopy is suspended from the ceiling and area below is open to the flames. 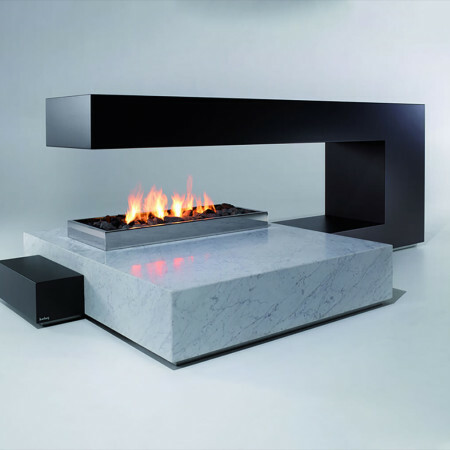 The suspended zinc fireplace is shown as part of a shelving unit and is a wonderful way to break up a space. The fireplace could equally be completely free standing in the middle of a room. Why not recess a TV into the floating top section? 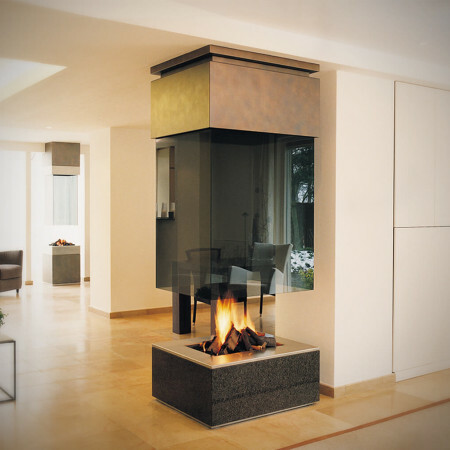 To understand all the possibilities and how a suspended fireplace could be incorporated into your project, get in touch and speak to a speak to a Design Consultant.